This is a wonderful way to power up with a filling and delightful breakfast to keep you and your kids going all morning. 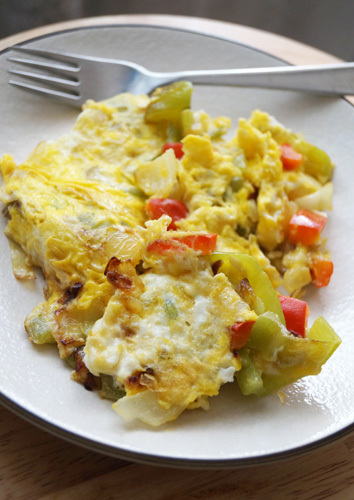 Our veggie omelet tastes a lot better than food from a drive-thru, and it is much healthier. This omelet is also suitable for a light brunch. The combination of protein, fiber, and healthy fat make it a nutritious, family-pleasing meal. It is a great meal when peppers are in season, and eggs go so well with peppers. Add the right amount of condiments and spices for an amazing meal. Deseed and chop the peppers into small pieces. Chop the small onion. In a large non-stick skillet over medium-high heat melt the butter and cook the chopped peppers and onion until golden (about 2-3 minutes). Add the eggs, salt and the pepper. When edges of the omelet appear cooked using a spatula flip the eggs over. Use a spatula to slide the omelet onto a plate and serve. Garnish with sliced red pepper.